I suppose I’m a criminal now. After years of cautious adherence to this country’s judicial system, I have stepped outside the law and committed a theft. A few weeks ago, at work, I visited the stationery cupboard and left with a dozen pads of post-it notes. I’d only needed one, but they came as a pack and I didn’t have the time to separate them. As I walked away, the pads stowed confidently under my arm, no one seemed to care, or even notice. It was the perfect crime. My office-supply misdemeanour sprung from the desire to structure my life through to-do lists. As I’ve lost every notebook I’ve ever owned, a pad of disposable paper was ideal, but left me with the issue of eleven superfluous pads. Traditionally, post-its aren’t used for much beyond memos and passive-aggressive messages left in fridges, which meant I had to get creative to dispose of my purloined stationery loot. I’ve started leaving a pad in my food cupboard, updating it through the week. Then, I’ll wander my local supermarket with the top post-it stuck to my basket for easy reference. I was insufferably pleased with myself for developing this technique until I asked around and discovered it was common practice. Crestfallen, I felt like Captain Scott, reaching the South Pole to find that Roald Amundsen had beaten him to it, a Norwegian flag where he’d expected virgin snow. Using post-it notes to clean computer keyboards is an old trick now categorised as a ’life hack’ by websites obsessed with that sort of thing. The idea is to swish the sticky strip under the keys to collect lurking crumbs and lint. When I tried this, it became clear that whoever came up with the concept had never met my keyboard, which stores several bagels’ worth of crumbs. After minutes of fruitless cleaning, I abandoned the post-its and jimmied up each key individually, using cotton buds as tiny, inefficient mops. Somewhere on the internet this is probably called a life hack too, but it could be more accurately described as a bit of a pain. I’ve always been suspicious of people who use proper bookmarks. This is because I mostly read either in long, slothful stretches, or in fevered gasps at bus stops and whilst friends use pub toilets—situations that don’t call for cumbersome reading aids. Quite unreasonably, I believe that the marking of one’s place in a book should be the province of old train tickets, receipts, and other flotsam recovered from coat pockets. The post-it note improves upon such detritus: intrinsically impermanent, its low-tack adhesive makes it as unlikely to fall from your book as it is to last longer than a week. It began when, in a moment of uncertainty, I wrote down Pete Holmes’ quote DO THINGS AND FEEL HAPPINESS as a message to myself. Since then I’ve filled an entire pad with my favourite sentences. I’m loath to call them ’inspirational,’ but that’s mostly what they are. Essentially I’ve created a Page-A-Day calendar but with my own scrawled handwriting instead of frolicsome cats or Dilbert. Stationed next to my computer, where I inevitably need it most, I unveil one whenever I feel low. From the encouraging (”YOU CAN MAKE ANYTHING BY WRITING”) to the sage (”SCAN NOT A FRIEND WITH A MICROSCOPIC GLASS”) to the obtusely aphoristic (”YOU CAN’T UN-RING A BELL”), they feel as personal and meaningful to me as the clichés on fridge magnets feel the opposite. ”Hey guys,” said the toaster, ”I’ve become sentient!” It followed this with a smiley face, because it liked emoticons. Despite its lack of opposable thumbs, or any digits for that matter, it had somehow managed to write on a post-it note. My housemates were nonplussed by the astonishing development. A day passed and a second message appeared: ”Ask me about life as a toaster!” It had thoughtfully provided a pen and some post-its for the task. My housemate Ben acquiesced: ”Please get better at toasting both sides of a piece of bread. What’s your favourite colour?” The answer was orange. Their correspondence continued cheerfully until Ben went on holiday. 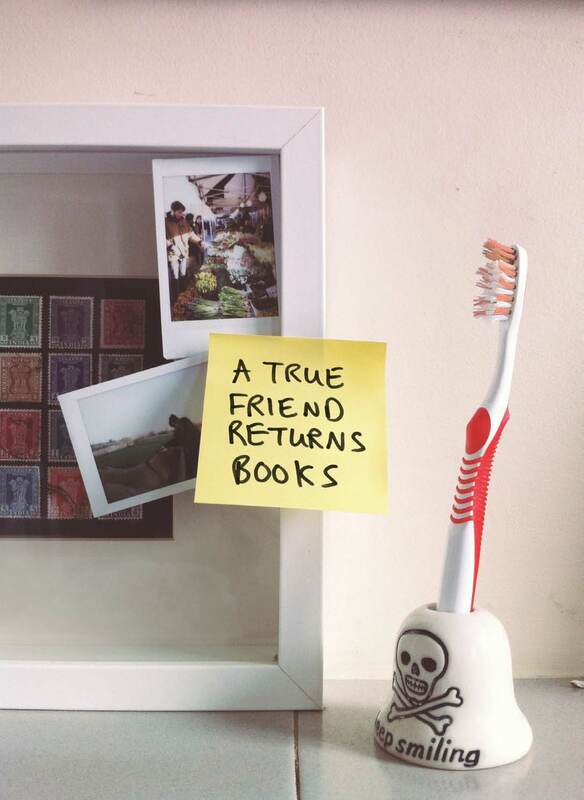 He eventually returned, as housemates do, but the moment had passed. The toaster’s brief experiment with sentience was over. As the surfaces of my house became accustomed to the sticky embrace of pressure-sensitive adhesive, there was one frontier remaining: my own visage. One night, with midnight disappearing behind me, I made a beard using the final pad. Whilst it was pleasingly fulsome, something wasn’t right. Staring at my face in a mirror, I became acutely aware that there was a void in my life, one that I was attempting to fill with post-it notes. I’d already tried cycling, gardening, single malt whisky, Twitter and elaborate sandwiches, and now I had half a pad of post-its stuck to my chin. What was wrong with me? The bearded face in the mirror just stared back. Seeking comfort, I picked up another pad, peeling off the top note to reveal the one underneath. ”CORDUROY IS, IN ESSENCE, A RIDGED FORM OF VELVET,” the note said, and it was right.